There are currently 169 people online. 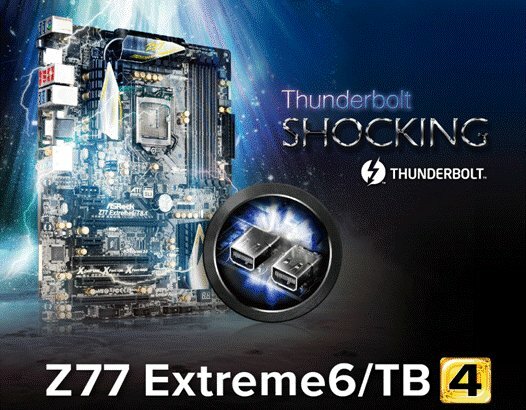 ASRock introduces the Z77 Extreme6/TB4, a new variant of the Z77 Extreme6 motherboard with two Thunderbolt ports. Pricing is unknown. Few things in life are more complicated than the ports on a motherboard’s rear panel. Not only do they disguise themselves in different shapes and sizes, they also serve for unique purposes and offer distinct performance. However, currently there is one in particular that stands out and deserves recognition – Thunderbolt! The leading motherboard manufacturer ASRock is joyous to announce that its new motherboard Z77 Extreme6/TB4 is equipped with two new Thunderbolt ports that support the revolutionary new file transfer technology. Via Thunderbolt users may expect dual channel up to 10 Gbps per port transfer speed, which is also bi-directional and dual protocol friendly, including PCI Express and DisplayPort. The best part is that it isn’t only good for one device. With the Daisy Chain feature, each Thunderbolt port supports up to six devices through a single compact port. So the two Thunderbolt ports on ASRock Z77 Extreme6/TB4 support a total of twelve devices! It is blistering fast, easy to use, flexible and full of potential. It is the future of high speed data transfer. Besides the breathtaking Thunderbolt technology, Z77 Extreme6/TB4 shares the same winning specifications as other ASRock motherboards. Premium Gold Caps, Digi Power and 8 + 4 Power Phase Design for providing stable voltage. Four DDR3 slots that are able to be overclocked to over 2800(OC)MHz. Support for NVIDIA Quad SLI and AMD Quad CrossFireX for those who pursuit high quality visuals, and Lucid Virtu MVP which adds even more mojo to the graphics. As for those trendy Windows 8 users, ASRock has the exclusive Fast Boot technology which allows you to login to Windows 8 within 1.5 seconds. Au contraire, there is Restart to UEFI for automatically entering the UEFI when the system reboot is too fast for loading it manually. Thunderbolt technology is unquestionably the great finale of year 2012. Toss in the fact that there are more and more motherboard’s that support Thunderbolt recently, ASRock is the only one that offers futuristic dual Thunderbolt ports, and also excels others by top notch hardware and software features. ASRock is proud to say that we are hardware ready for the fast paced future!